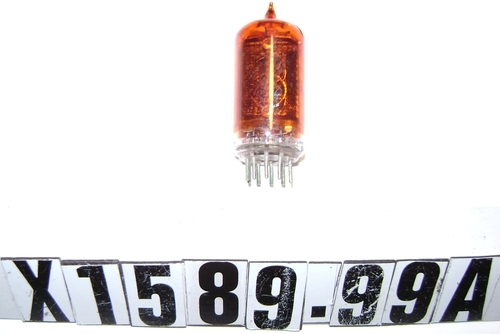 Nixie tubes such as these ones were used extensively as numeric displays in electronic instruments and computer equipment until they were supplanted by vacuum fluorescent and LED technologies in the mid- 1970s. They were invented at Burroughs. More elaborate Nixie-style tubes (ones with n segments) could display alphnumeric characters and a few speacial symbols as well. The term "Nixie" grew out of an internal Burroughs name for the tube, the "Numeric Indicator X (or ten)," abbreviatred to "NIX tube" and eventually to "Nixie." Donor note: "Philips BV of Holland started manufacturing Nixie-style tubes under license from Burroughs around 1956. Later, Philips had their American division Amperex make these tubes in their Brooklyn factory. Whereas Burroughs Nixies had separate pins for each electrode (requiring special sockets), Philips used the standard 9-pin miniature tube base on their ZM1030 series. Since this kind of tube would require at least 11 pins to accommodate the 0-9 digits and the anode, Philips engineers devised a way to multiplex the odd and even digits onto the same 5 pins, thus requiring only 7 pins total. The ZM1005 was the smallest Nixie type ever made, and was developed for electronic calculators and portable test equipment. It used a special socket which was unique to it."